Bicycle rental in London has just become a lot more fun with our electric bicycle hire. As easy to ride as a conventional bike, your rental electric bike will take you to all the best London sites, sweat-free, relaxed and at your own pace. For a fun day out in London, Electric bike hire is one of the most fun things you can do. Hire a bike, grab a helmet (if you want one) and head off on your tour of London. Our hire bikes are such fun you won’t be able to stop smiling. As soon as you feel the bike doing the hard work you’ll realise this has to be the best way to see London. Most people comment they had as much fun riding the electric bike as they did seeing the sites! We have a number of suggested bike tour routes in London for you to follow, and because our bikes require so little effort, you’ll be able to see much more of London than you would on a conventional hire bike. 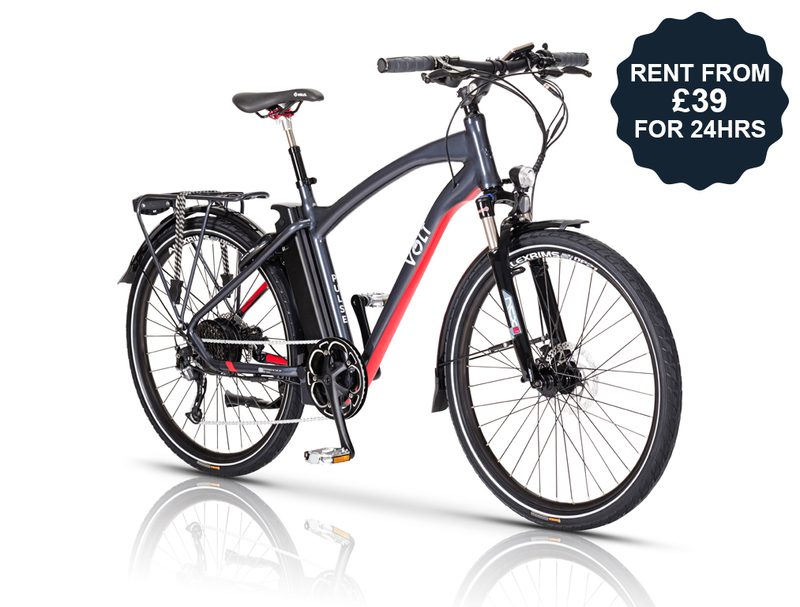 We use the VOLT™ Pulse Electric Bike which is extremely simple to use. It has a simple twist throttle that you can use if you just want to cruise along without pedalling or if you choose to pedal there are three different levels of pedal assistance to help make your cycling experience as pleasurable as possible. Our bikes have a maximum speed of 15.5mph which means that you can fly along as you tour the fantastic city of London!